Birth date and place c. 1824 Downpatrick, Belfast, Ireland. England, Wales & Scotland Barracks, St Mary Street, Cardigan, Wales (1851). 7 Vaughan Buildings, Castle Street, Liverpool, Lancashire, England (1861). Physical Description Height: 5 ft. 9 ins. Complexion: fresh. Eyes: light grey. Hair: dark brown. Marriage date and place 27 Jul 1858 St Nicholas, Liverpool, Lancashire (unproven). Children Mary Jane 1853, Liverpool, Lancashire. John 1863, Fremantle, Western Australia. Died 10 weeks, 1863. Sarah 1863, Fremantle, Western Australia. Died 11 weeks, 1863. Margaret 1865 (d.1865), Adelaide, South Australia. Death date and place 2 Nov 1883 Adelaide, South Australia. Burial date and place 5 Nov 1883 West Terrace Cemetery, Adelaide. 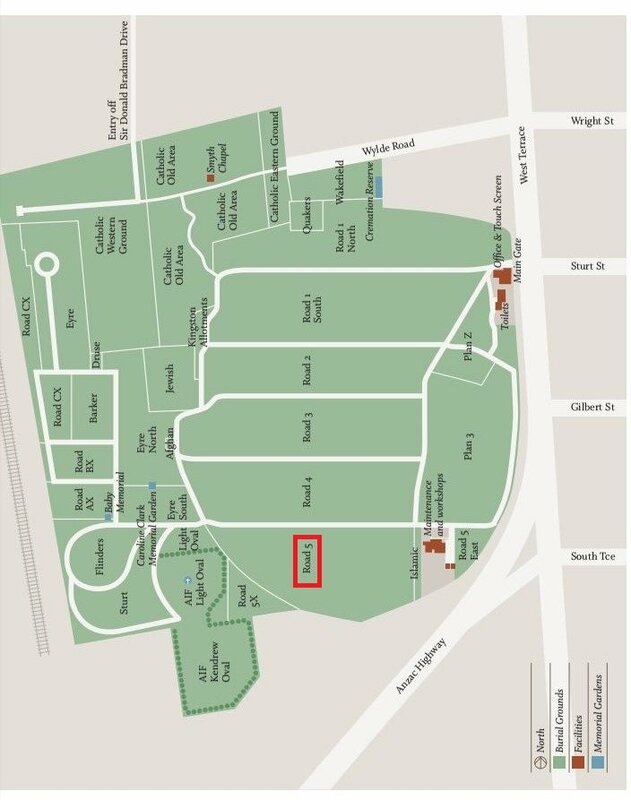 Road 5, West Side, Path 5, Site 24. 77th (The East Middlesex) Regiment. Regiment No. and Rank #1731 Private. Attestation date and place 7 Oct 1843 Liverpool, Lancashire. Service/Campaigns Mediterranean, Turkey & Crimea 2 years 2 months. 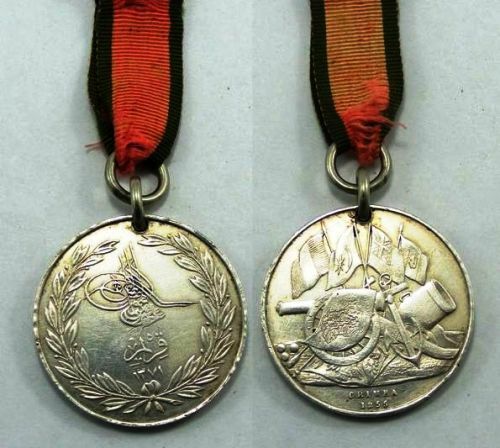 Medals, Clasps and Badges Crimea War Medal clasps Alma, Balakava (? ), Inkermann, Sebastopol. Casualty/Medical Casualty Roll: Missing in Action. Final Attack on the Redan. 08 September 1855. A musket ball entered the upper part of the right side of his chest (between the 1st and 2nd ribs) and at about the outer 3rd, and paping inwards and backwards came out beneath the inferior angle of the scapula on the same side. Resulting from this, he has had haemoptysis, and is very short winded on exertion, is also unable to carry a pack, or bear any constriction about the chest, and the power of his right arm is much impaired as regards any great exertion, on the carrying of weight such as that of a firelock. Wounded on Sep 8th /55 at the final assault on Sebastopol. Discharge date and place 15 Jul 1856 Chatham. Length of Service 12 years 283 days. Post Discharge Pension District Liverpool. Bristol (1858). Liverpool (1858). South Australia (1865-1879). Pension Amount 1/- per diem. 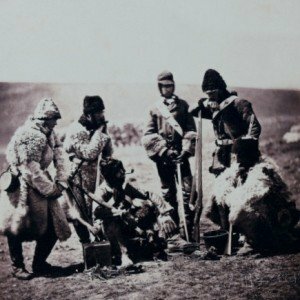 Refused increase in pension 20 Oct 1857. Express & Telegraph 4 Feb 1880. Departure from WA Sea Ripple dep. 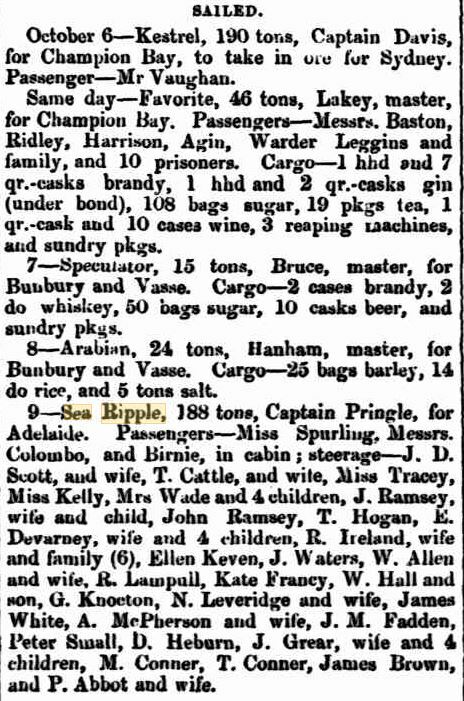 9 Oct 1864 Fremantle; arr. 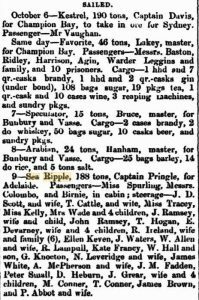 23 Oct 1864 Adelaide.